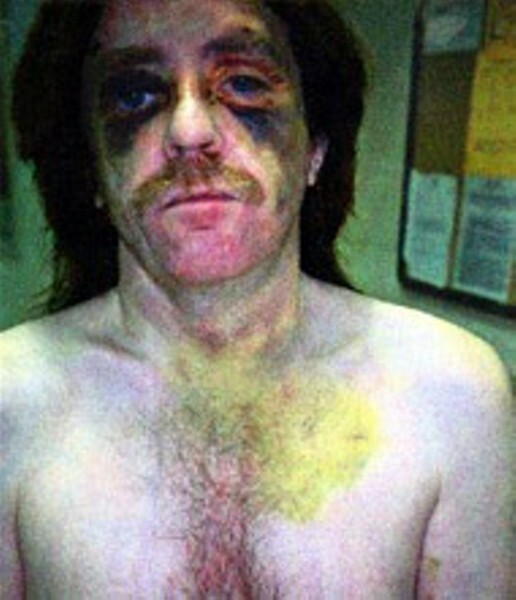 Paul Dameron Midgett after his alleged beating by Mecklenburg County prison detention officers. Recent and pending lawsuits by former inmates claiming to have been abused at Jail Central downtown offer a disturbing view of how the sheriff's office carries out part of its duties. In fact, the lawsuits they've filed against Mecklenburg County Sheriff Jim Pendergraph, and more than 25 of his deputies, read like tales from a Turkish prison. In these suits, inmates describe beatings of an almost ritual nature by gangs of out-of-control detention officers whose superiors and co-workers often looked the other way, or worse, looked on. In several of the lawsuits, the prisoners say their hands were bound so they couldn't fight back while they were kicked and beaten senseless. In another case, a man medically diagnosed with diabetes as a child was told by jail officials that he didn't actually have the disease when he begged for medical help. He's now going blind from diabetes.With the exception of one case, all of the incidents described in the inmates' lawsuits took place at Mecklenburg County Jail Central, a sort of holding tank for those who've been charged but not convicted of crimes and are awaiting trial or bond. Fifteen of the 25 sheriff's officers named in the suits are still employed with the sheriff's office and five no longer work there. 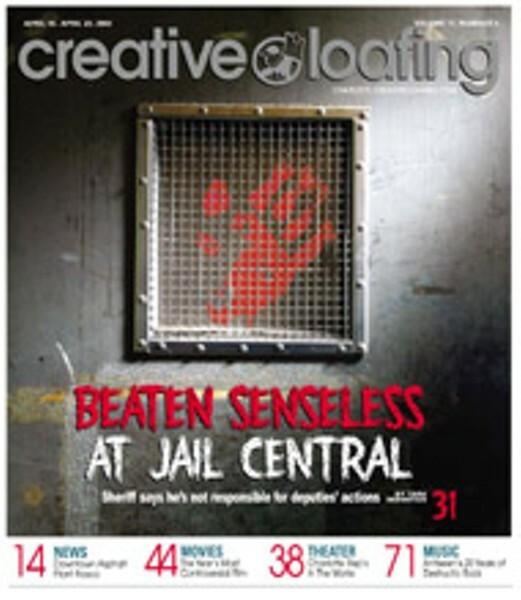 According to a document provided to Creative Loafing by the sheriff's spokesperson Julia Rush, the sheriff's office isn't sure whether the remaining five officers are still employed by the sheriff or not. So far, Sheriff Pendergraph, who was elected by county voters in 1994 and presides over the county's jail system, has appeared to be fairly bulletproof in court, and none of these cases has yet made it to trial. Three of the seven cases against Pendergraph and the deputies allegedly involved in the beatings were filed by inmates acting as their own attorneys who lost quickly after attorneys for the sheriff danced circles around them. A fourth case was dismissed after a Charlotte attorney representing an inmate failed to file court documents in a timely manner. The same judge, US District Court Chief Judge Graham C. Mullen, has dismissed all of the beating cases that have failed to go forward. But Pendergraph's luck may be running out. Former federal prosecutor Charles Brewer, now an Asheville civil rights attorney, appears to have launched a personal crusade to assure that former Mecklenburg County Jail inmates get their day in court. Brewer is now handling three prisoner-beating cases against Pendergraph's office, including an appeal of a case in which an attorney's error caused a dismissal. All three cases remain open, and he appears to have won an initial victory in one of them, after a judge refused the sheriff's request to dismiss it. Another Charlotte attorney is representing a client in a fourth case in which a judge has ordered a mediated settlement conference. Brewer declined to publicly comment on these cases for this article. In most of the beating cases against the sheriff and his deputies, the attorney for Pendergraph has argued that the sheriff shouldn't be held liable for the negligent supervision or training of his employees, or for their actions. When CL asked Pendergraph in writing if he considered himself to be responsible for the actions of his officers while they were on duty, a spokesperson for the sheriff neglected to answer the question. After we submitted the question in writing to the sheriff a second time, he once again neglected to give us a straight answer. Instead, spokesperson Julia Rush wrote, "The Sheriff has ultimate responsibility for hiring and firing (when appropriate) all employees of the Mecklenburg County Sheriff's office." Like Pendergraph, Mecklenburg County, which was also represented by the attorney for the sheriff in these cases, similarly argues that the county bears no liability for the alleged misconduct of the sheriff or his deputies. So, who's responsible for how inmates are treated at the jail? That will be up to the courts to decide. Because public officials, and in particular sheriffs, have strong legal protection from lawsuits at the state and federal level, winning a case against Pendergraph or his deputies will be difficult at best, regardless of whether the alleged beatings actually took place or not (see accompanying sidebar). Legal skirmishes aside, the question remains whether the filing of so many similar cases indicates a brutality problem at the jail. "I would say that that number of cases is pretty unusual," says Amy Fettig, a litigation fellow with the ACLU who represents inmates in abuse cases against prison officials. "It sounds like that's a jail that needs some investigation. The odds of a prisoner being literate enough to file a case and then to actually get it to that stage, [that means] the cases are probably representative of much more. Obviously if they keep getting dismissed and there is some brutality going on there, the sheriff is very confident that he doesn't have to make any changes."